I was thinking about my previous post about why Montreal has changed my perception of Copenhagen. I like my neighbourhood in the city of Frederiksberg, which is a municipality surrounded by Copenhagen municipality on all sides. My kids go to school and kindergarten here and you always seen people you know when you walk or cycle around. It's a bit dull if you think about liveable streets, though, as are many neighbourhoods in Copenhagen. In many ways, the reason is, in part, architectural. A majority of of the blocks of flats in the neighbourhoods surrounding the ancient city centre were slapped up in tact with the industrial revolution. Late 1800's to early 1900's. To accomodate the rush of workers who were moving to the city. Fair enough. But have a look at the map below. At first glance, there is a lot of green. Looks nice. But notice all those squares that surround the green spots. Those are courtyards. Nice courtyards, renovated in most cases with playgrounds for kids and benches/tables for sitting at. Most of them are shared spaces used by the many people in the many flats that surround them. I like my courtyard and every courtyard I've had. It's a little 'espace libre' where you can relax. Looking at those courtyards is as close as you'll get, however. They're really nothing more than gated communities. Even Copenhageners when walking down the street and passing an open port to a courtyard they don't know will stop and stick their head in. A gate was left open and it's always fascinating to be allowed an illicit glance into a hidden world. It's like looking at a stranger's bookshelf or rummaging through their fridge. So when the green bits are locked away and only the locals that surround them are allowed access, that leaves you with the street as public domain. Look at the map again. All the flats in the densely-populated neighbourhoods border the sidewalks. The streets are, in a way, canyon-like. This is an example of what I mean. Sure, on this street there's not much traffic so there is no need for cycle tracks, but the street is not exactly inviting, is it? Unless you have a key to get into the luxurious spaces afforded in the courtyards. But you don't, as a rule. Only your own. Are these streets 'liveable?' Not if you think about it. There ARE exceptions, don't get me wrong. Wonderful exceptions. Everyone knows what they are - that's where everyone goes to hang out. Saint Hans Square in Nørrebro. Istedgade in Vesterbro. Etc. But they return home to their flat overlooking a street in it's barest sense on the one side and a private courtyard on the other. If they want to read a book outside they'll head to the gated community at the back. There are other exceptions worth mentioning. Above is a map of a little neighbourhood called Kartoffelrækkene - or Potato Rows. Brilliant narrow streets in the best terraced housing style. Tiny backyards and tinier front yards, which only serve to make the residents take over the street and use it as it was meant to be used. Great, liveable neighbourhoods. Ironically, many architects live in neighbourhoods like these. They don't build buildings or neighbourhoods like these, no no no, they just live in them and build big glass buildings in other peoples' neighbourhoods. The city centre is same same but different. There are courtyards but they are tiny and date back centuries so the streets are more alive. Well... during the day anyway. When they're filled with tourists and shoppers. Very few people live in the city centre, you see. It should be the throbbing, vibrant heart of the city - indeed the nation - but after the shops close it rolls over and goes to sleep. Most of the interesting nightspots are in the neighbourhoods so us Copenhageners go there, leaving the city centre to it's tacky discotheques frequented by surburbanites who came in on the train for a Friday or Saturday night. You can ride a bicycle piss drunk down the oh so famous pedestrian streets on a Saturday night and not have to worry about hitting Swedish tourists. So where are the foreign consultants coming to Copenhagen to tell us how to create more liveable neighbourhoods? How to revive our city centre? Bring them on. The solution - and this isn't from a bicycle consultant point of view either, believe it or not - is reclaiming more space from cars. Creating wider sidewalks and space for residents to hang out, play, be a part of the urban fabric - facing the city and not the enclosed walls of their courtyard. More on-street tables and chairs and benches. Lower speed limits for cars. More traffic calming. If you come here, visit the street called Nansensgade. We CAN manage it if we try. 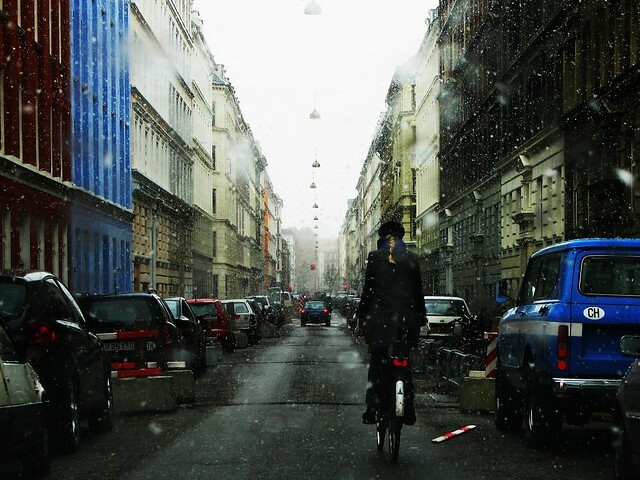 Be astounded at our bicycle culture. Be amazed at the way the bicycle contributes so much to the fabric of our urban life. Absolutely. But please send someone to fix our humdrum streets. I'm left wondering... is it the architecture in our densely-populated neighbourhoods that has caused Danes to be reserved as a people? Or is it Danish reserve that led to the building of such inadvertantly gated communities? At least on our bicycles we participate in society and all share a sense of humanity in the way we are elbow to elbow with each other on our way from A to B. At least we have that. At least we can inspire other cities to do the same. But we're beginners when it comes to liveable neighbourhoods. But when we're at A or B we aren't a part of very much in a societal sense.